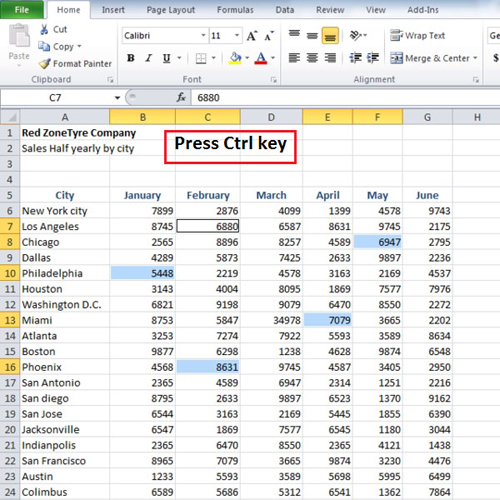 Once you enter the data in Excel you should know how to work with it quickly and efficiently. 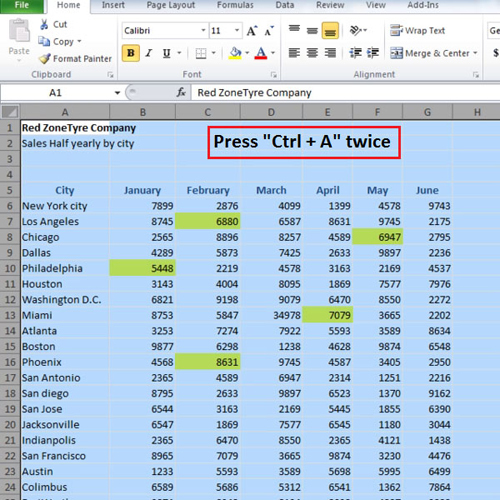 While learning how to use Microsoft Excel you’ll realize that targeting large groups of data can be tricky and if you do not know the right steps then it becomes really hard to find your data and make changes to it. The numbers of cells that Excel has in one sheet are so many that even scrolling all the way down may become hectic so one should know the right shortcut keys. 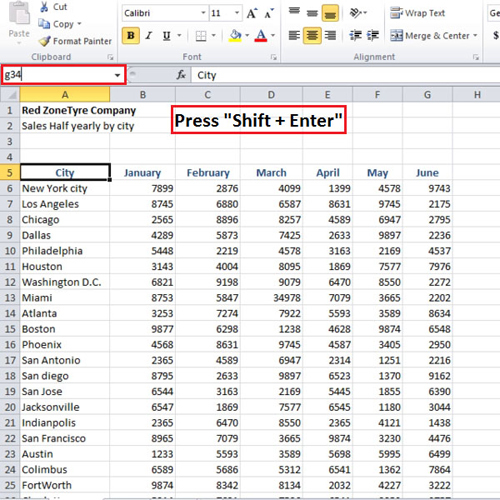 Follow this step by step tutorial to learn how to target large data in Excel and make changes to it easily. 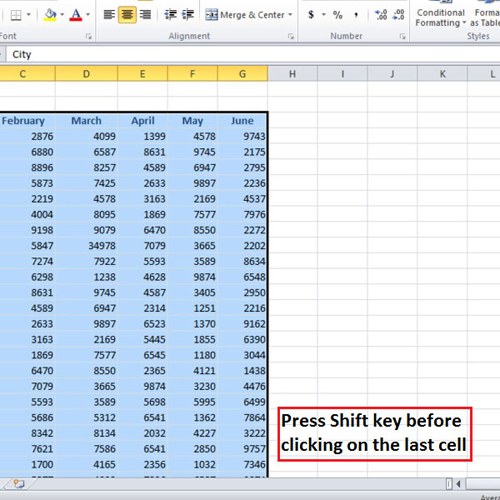 If you want to select your data in order to change or copy it then simply click on the first cell and drag your mouse all the way to the last cell which has data in it. The other way of doing this is that click the first cell and then before pressing the last cell press the “shift” key. If you have a very large data and you know a specific cell that you want to go to then you can write the cell number in the cell reference bar or the search box. This is situated on the left side of the screen. If you know the cell number of the last cell which carries the data then enter the cell number and press “shift + enter”. The whole area till the last cell will be selected. Sometimes you need to select different cells and copy them. These cells may or may not be next to each other. If they are not then you can press the “ctrl” key and click on those cells that you want to select. There are times when the large data in excel that you want to target a different rows or column. 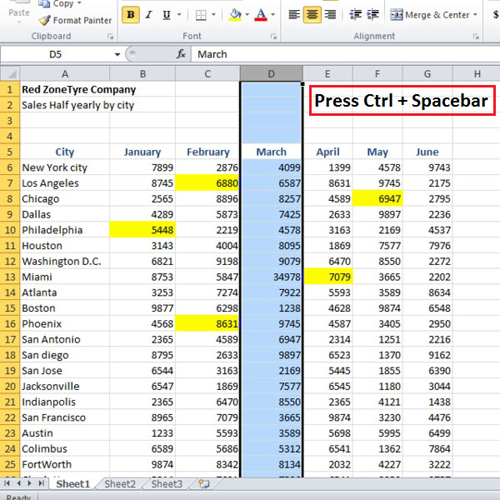 If you press the “ctrl” key and click at the beginning of the row or column then that row and column will be selected. 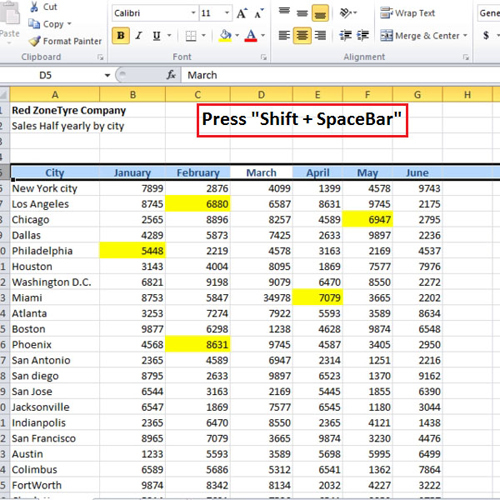 You can press “ctrl + spacebar” to select the entire column. Sometimes selecting entire rows or columns is necessary if you want to change the font color or do some kind of formatting to that entire row or column. So the shortcut to select the entire row is “shift + spacebar”. If you press that then the entire row will get selected. A region is an area around which there is data and it continues until there is a gap. So click anywhere in the region and press “Ctrl + A” which is a shortcut to select the whole region. If you press “Ctrl + A” again then the entire sheet will be selected. It is essential to know of these shortcuts and methods while you are learning how to use Microsoft Excel so as to work efficiently in this software.